Before the launch of the first commercial ISP in the US, before the invention of the web, and before the term “net art” entered the lexicon, a rich history of artistic involvement with the internet and other networks had already taken shape. 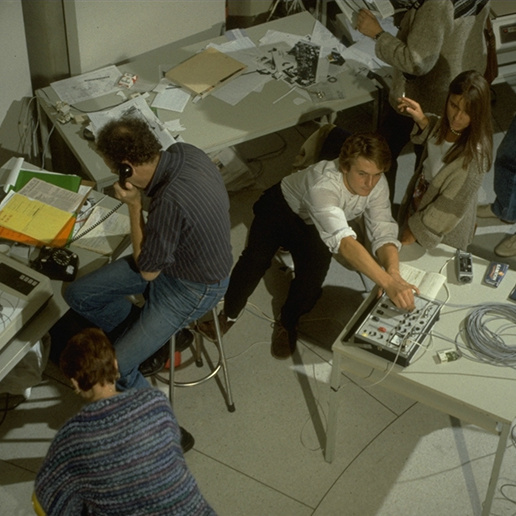 In the 1970s and early 1980s, artists employed satellite connections, bulletin board systems, slow-scan TV, and videotex to facilitate new kinds of community and cultural exchange and to explore the idea of art as information. This event, presented alongside the exhibition “The Art Happens Here: Net Art’s Archival Poetics,” will feature video clips and presentations exploring several early artistic experiments with networks, illuminating their particular stakes, and addressing their relatively overlooked status in cultural memory. The event will feature a talk by art critic and theorist Josephine Bosma, who will show how exploring this early history brings net art, in her words, “into focus as a hugely diverse field in which online and offline works and practices intermingle and co-exist, while older strategies and technologies never really die.” A presentation by art historian Philip Glahn will explore Mobile Image’s Electronic Cafe ’84 (1984), an experiment in multimedia telecollaboration that allowed content to be created and shared among hubs in neighborhoods across Los Angeles. New Museum and Rhizome public programs are made possible, in part, through the support of the New York City Department of Cultural Affairs in partnership with the City Council, and the New York State Council on the Arts with the support of Governor Andrew M. Cuomo and the New York State Legislature. Josephine Bosma’s participation in this event is made possible by Dutch Culture USA program by the Consulate General of the Netherlands in New York. Support for “The Art Happens Here: Net Art’s Archival Poetics” can be viewed here.